UPDATE: Another Springfield XD pistol bites the dust. A friend of mine who shoots with the Right On Target Group has had his SXD for a few months. Last week, when we went out to shoot, he walked over to the range officer who then brought the gun to me to show it to me. The striker retaining pin, (you know like the one that rose up like a cobra out of my SXC 9mm) which is a small tubular pin that is inserted in the top of the slide had not only worked its way out of the slide, but had sheered off one side of the pin on the way out. So, that makes 3 Springfield XDs that I have personally owned, handled or shot that have had faulty parts. And this one is some 4 years removed from the first two that I owned and reviewed. Same part, same problem. And you know, it's kind of important that a striker retaining pin stays in. 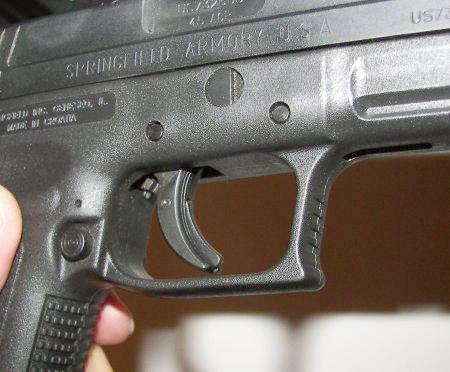 This is inexcusable and a clear indicator that Springfield has done nothing to deal with this stupid design that has an open hole in the top of the slide with a steel tube that may at any point slip up and out leaving your gun inoperable. The Springfield XD is what it was 4 years ago. A gun with a design that causes parts to fall out, stick and fail, and a trigger pull that Springfield still can't figure out. Now for any Springfield XD pistol owners that own a SXD that has never had a problem, I get it. Some don't. But I've owned two and shot and observed two others over an extended period of time. 3 out of 4 have failed. So save cussing me out because what I've reported are facts about 3 guns that have failed miserably in the quality control department, with a faulty design in the basic model that has not changed since they first hit the shelves. 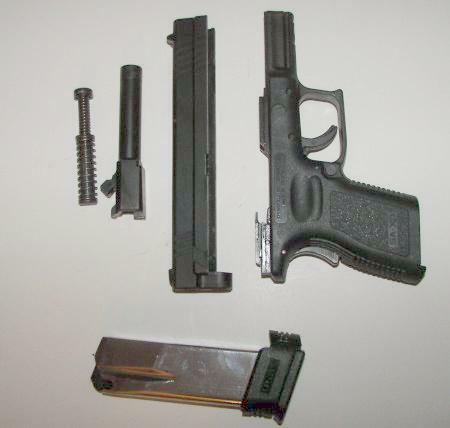 UPDATE NOTE: The two guns reviewed below were two early models of the Springfield XD pistol. And while they basically stunk, the XD and XD-M of today are not likely to have these issues. I actually often recommend that people try them when they write asking for good guns they might try. The guns are, however, over-rated, and over hyped. Springfield needs to do something to significantly improve the mushy trigger pull that is ridiculously rated from 5.5 - 7.7 lbs. Which is it? A gun that is given this much promotion and attention should have a trigger pull that can be defined by the manufacturer. Otherwise the guns appear to now be robust, durable and dependable....like other good tactical handguns. Just not better. 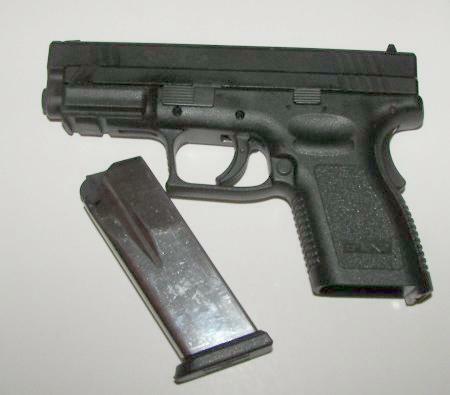 3/8/2008: Well, if pistols had a coming messiah the Springfield XD would be it. At least that's what seems to be the consensus among the gushing gun writers that insist this handgun is not a GLOCK knock off.....gimme a break. Let's clarify one thing right now. ANY pistol that has a polymer frame and is striker fired is a GLOCK knock off. That's not necessarily bad in itself, it's just a fact. The Springfield XD not like a GLOCK? Let's see. Polymer frame: Like a GLOCK. Striker fired: :Like a GLOCK. Trigger safety: Like a GLOCK. General size and shape: Like a GLOCK. Now again, all of that is not bad in and of itself. What is bad is that the trigger pull is heavier: Inferior to a GLOCK. The finish is pitiful compared to a GLOCK: Inferior to a GLOCK. That's the problem with trying to copy something that is best in class. The copy better get it right or the faults will be glaring. I have now owned two XD's: the .45 ACP Compact, and the 9mm Tactical model. The one I currently own (and is currently for sale)is the .45 pictured in this article. My first experience with my 9mm Tactical Springfield XD was pretty good as far as firing and accuracy goes. However, every couple of magazines, a shell would fail to fully eject. I was using Monarch brass, Blazer aluminum and Winchester all with 115 grain FMJ bullets. And don't start writing me calling the ammo all sorts of nasty names. If you have a gun that is not dependable with any uncoated factory ammo, there is something wrong with the gun, not the ammo. My GLOCK shoots all these 100% dependably. The Winchesters, which are probably slightly hotter, shot dependably. Then, I noticed a small peg starting to rise up out of the top of the slide towards the rear. That peg is the striker retaining pin that had not been properly seated and expanded. That took a trip to the gunsmith that had sold it to me to fix. I kept the gun for a while and shot different types of ammo through it. Some did ok. Others failed to fully eject: Bad Gun. No other explanation. I ended up selling the gun to a private buyer with full disclosure of what I was experiencing with it. Not being terribly intelligent, I purchased the Springfield XD .45 ACP Compact model pictured here. The gun comes with a 10 round magazine (i.e. "Compact") making the grip shorter for concealment, though the gun is so fat, it still doesn't make a good concealed carry gun. 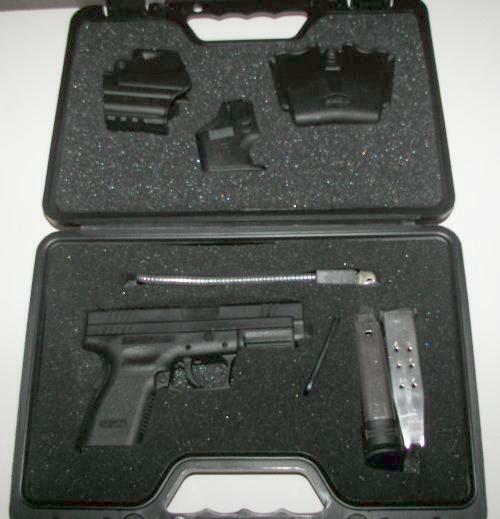 The gun also comes with a second, 13 round magazine converting it to a duty sized pistol. This is a nice touch for people who like both worlds and can manage to carry a fat, short gripped pistol. The Springfield XD also comes with a nice assortment of gear (pictured below) which includes a gun holster, mag holster, two magazines, loader, gun lock and case. Again, a nice touch to have a turn key shooting assortment. The .45 Compact pictured here was similar to the 9mm in that the first time I had it out shooting, guess what it did not do? Eject a shell casing. Two guns, two ejection problems. Both XDs. And then the .45 developed another irritating little problem. After a range session shortly after I purchased it, with the gun unloaded, I noticed the "loaded chamber indicator" on top of the gun was up, apparently notifying me the gun had a round in the chamber. I checked again. No round. So, I manually tried to push it back down. No luck. It was stuck. 2And not just regular stuck where you could tap or push it back down. It was stuck to the point where I had to take a block of wood, cover it, and knock it back down with a mallet. After a half bottle of oil, and several times knocking it down and pushing it up, it finally loosened up and laid down.....almost. Never did go completely flush with the slide. 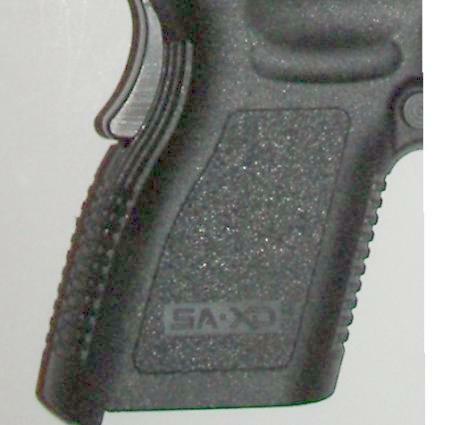 The XD has a grip safety like a 1911 style pistol. It gives an added measure of safety when the gun is not gripped firmly and when being inserted into the holster. Accuracy with the Springfield XD .45 has been so-so compared to the 9mm - and yes, that is considering a comparison of me to me (my shooting style and ability with both guns). The 9mm tactical 5" model could actually have been a tack driver in the right hands. The compact model, I don't think so. The Springfield XD breaks down into five user serviceable parts (sounds kinda like a .....GLOCK). When the barrel got heated up on both guns, they got noticeably harder to hit what I was shooting at. Now, scream at me that it's normal for this to happen, and I'll hand you my GLOCK or my Taurus 1911 and let you fire them till you can't hold your hand up any longer. You'll still be hitting where you are pointing. But with the Springfield XD 9mm or .45, it very noticeably affected accuracy. 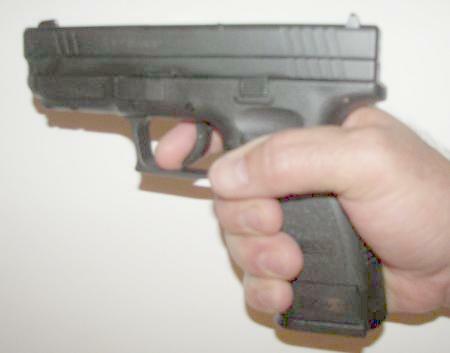 The first picture below shows the grip in my average hands with the compact (10 round) magazine installed. The next picture shows the gun with the duty size (13 round) magazine. The Springfield XD barrel has a polished feed ramp. And finally, it sports a trigger safety (aka GLOCK), and a 1911 style grip safety. 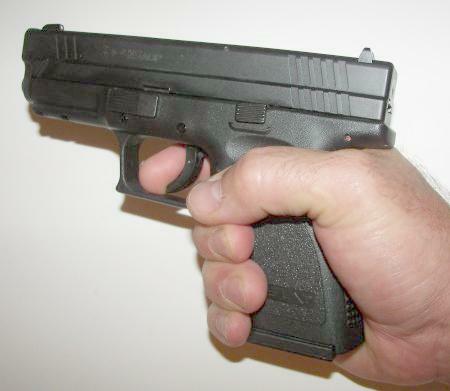 Bottom Line: I gave the Springfield XD two chances at my own expense. I tried all types of ammo. I wanted the guns to work and feel right. I actually approach all guns I purchase with positive hope that they will perform, feel and shoot as I have been promised by their reviewers. The Springfield XD in 9mm and .45 did not.